Religion is the cradle of human civilization and will always be a core influence in our society. As the world becomes more multi-religious and multi-ethnic, however, there is a seemingly diminished respect for the difference. And more concerns rise towards this new threat to peace, which can be seen in the form of religious hatred and persecution. Seeing the current status of the religious world, HWPL thinks the solution of peace. ‘How can we make it?’ The answer they found is the Scriptures. Because it represent the accumulation of not only the spiritual and moral teachings of the respective faiths, but also a fundamental standard of human conduct. Why Scripture? Although the common objective that all religion is the great things, these messages are often overlooked by people. Because religious people fight with each other first. They showed hostility and started a war. So peace is becoming an elusive concept. So HWPL approach towards the root cause of this hostility between faiths, defined as the misunderstandings that arise from the misinterpretation of these scriptures. 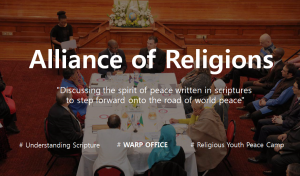 It began from the World Alliance of Religions’ Peace (WARP) Summit in 2014 where representative leaders from 12 religions, along with 950 participants, signed the Unity of Religion Agreement. At that time, the WARP Office Meeting was established and it has been actively practiced worldwide since then. Strong cooperation and a network of religious communities formed by the commitment of those at the WARP Summit 2014 has been integrated with a deeper understanding of the core principles and values of each scripture. Thus, within its Alliance of Religions Initiative, in remembrance of the promised agreement for the unity of religions, HWPL has promoted interfaith communication among religious leaders, who play an integral role in educating their congregations about differences in religious beliefs in a way that should not hinder the progress of establishing world peace. 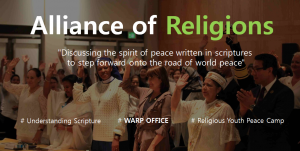 The World Alliance of Religions’ Peace (WARP) Office Meetings are HWPL’s worldwide peace dialogue series on interfaith relations and scriptural texts. These meetings aim to prevent the conflicts caused by religious misunderstandings and bring forth peace through gaining a deeper understanding of the standards and teachings of each religion, as well as the concept of peace spoken about in each scripture. The Peace Office Meetings have become a global movement, and an increasing number of influential religious leaders are now going beyond their traditional roles and work as messengers of peace. This innovative initiative has stirred up discussions among leaders of various faiths and has increased peaceful interactions between them. It has shown itself to be an effective tool for breaking down the walls between religions and achieving our common goal: peace. The Peace Office Meetings are becoming a way to create a bridge between religions in all areas of the globe. The aim of the HWPL Religious Youth Peace Camp is to engage youth and youth organizations in dialogue and conflict transformation activities based on inter-religious and inter-cultural learning. Camp participants learn about the general history of world religions, find the root cause of and plausible resolutions to religious conflicts and disputes, examine the religious community’s roles for peace, and experience cultural exchanges.